Nintendo has been known for creating innovative gaming devices that offer users a unique gaming experience. The company struck gold when it released the Wii, a console with a focus on motor activated controls. To date, the Wii has been the best-selling console ever developed by Nintendo. However, Nintendo has been brought back to drawing board after its competitors, Sony and Microsoft, revealed their intent to create consoles with next-generation hardware. Enter the Nintendo Switch, a cross between console and mobile gaming. Instead of fighting with Sony and Microsoft over the pure processing power of their console devices, Nintendo has taken a different approach altogether. The Nintendo Switch has the ability to alternate between console style gaming and a mobile gaming device. Like the Wii U Gamepad before it, the device features the same screen dimensions at 6.2 inches wide. Unlike its predecessor, however, the Nintendo switch is much smaller, allowing users to make more comfortable use of its tablet form on the go. The device also displays improved touch-screen capabilities and enhanced screen resolution at 1280x720p. The new specs allow for a nice balance of console-level performance and visual clarity. The controllers that come with the Nintendo Switch have also seen some upgrades from previous systems. The Joy-Con controllers use an improved feedback that translates to a much smoother gaming experience. Additionally, they weigh in at less than a pound, making the controllers ideal extended gaming sessions. The portability of the Nintendo Switch is among its most appealing qualities. For those of us who remember the good old days when we could shove our Gameboy into our pocket, the Nintendo Switch offers a similar convenience. Even with the controllers attached, the device is roughly 9 inches wide, meaning it’s the perfect size to put in a backpack or shove in a pair of cargo pants. While in console mode, the Nintendo switch is capable of 1080p visuals on a TV. That being said, the system does have its performances issues in console mode. The Legend of Zelda: Breath of the Wild barely caps out at 30 FPS and has several rendering issues on the Switch. These types of issues would be more acceptable if Zelda displayed Skyrim level detail and textures… but it doesn’t. Issues like these do not bode well for the long-term future of the Switch. In conclusion, the Nintendo Switch is a step in the right direction, despite the below average console experience. Every other feature of the Switch functions very well. Handheld gaming remains to be Nintendo’s call to fame. Games play just as well if not better on the Switch when it’s in tablet versus TV mode. Rendering is dropped to 720p and the GPU speed drops significantly, however the effects of compressed textures are much less noticeable. 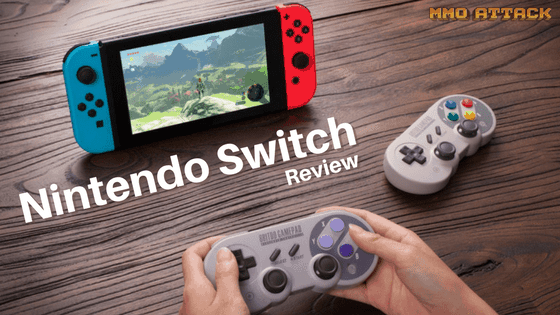 As a handheld gaming system, the Switch is top-of-the-line, but it unclear if Nintendo will continue its endeavor of being a player in the console gaming market. Want to see our very own gameplay? Check out these clips of one of our MMO Attack crew members testing out the Nintendo Switch.